Contract workers protest at Philly International Airport. HUNDREDS OF THE lowest-paid employees at Philadelphia International Airport walked off the job for 24 hours starting late Wednesday night to protest for higher pay and better working conditions. Although the work action by nonunionized employees of three companies that have subcontracts with airlines did not disrupt flights, said a spokeswomen for the airport and its largest tenant, American Airlines, the workers drew influential allies to their cause. A handful of City Council members were at the airport yesterday morning to stand with the baggage handlers, cabin cleaners, wheelchair attendants and others - as was Mayor-elect Jim Kenney. "You have every right to collectively bargain with your employers. That's how this country was built. That's how this country is going to be," Kenney told them. "We passed that law requiring the $12-an-hour wage. They're going to follow that law. Come January 2016 [when he takes office], things are gonna change." Gabe Morgan, vice president of Service Employees International Union Local 32BJ, said that most of the protesting employees received pay increases to $12 an hour in June, but that the average wheelchair attendant still earns between $8 and $9 an hour. "Even the workers who are making $12 an hour are being mistreated at work, threatened, harassed," he said. "There are people here who work under terrible conditions." Unfair work assignments and random punishments and terminations - sometimes for speaking out about work conditions - are routine, Morgan said. "It's unbelievable that people can be treated this way at the nation's airports," he said. "And it's unbelievable that people still make as little money as they make working for such huge, wealthy, profitable companies." Morgan said the goal of the picketing - which ended at 10:30 last night and involved 300 to 400 workers - was not to disrupt air travel. "The purpose of the strike was to say to the companies, 'You have to respect our rights and we're going to use our rights to protest, our lawful right to collective action if you don't,' " he said. Victoria Lupica, a spokeswoman for American Airlines - which accounts for 70 percent of the airport's flights - said some employees of the three subcontractors showed up for work and operations were not affected by those who did not. Airport spokeswoman Diane Gerace said there were no reports that other airlines were impacted by the work action. Lupica referred questions to the subcontractors. Employees speaking for PrimeFlight and McGinn Security Inc., targets of the strike, said they would have no comment. Another target, Prospect Airport Services, did not return a Daily News call seeking comment. "This airport is owned by the citizens of Philadelphia," Kenney told the workers yesterday. "It's not owned by PrimeFlight, it's not owned by McGinn. It's not owned by American Airlines." 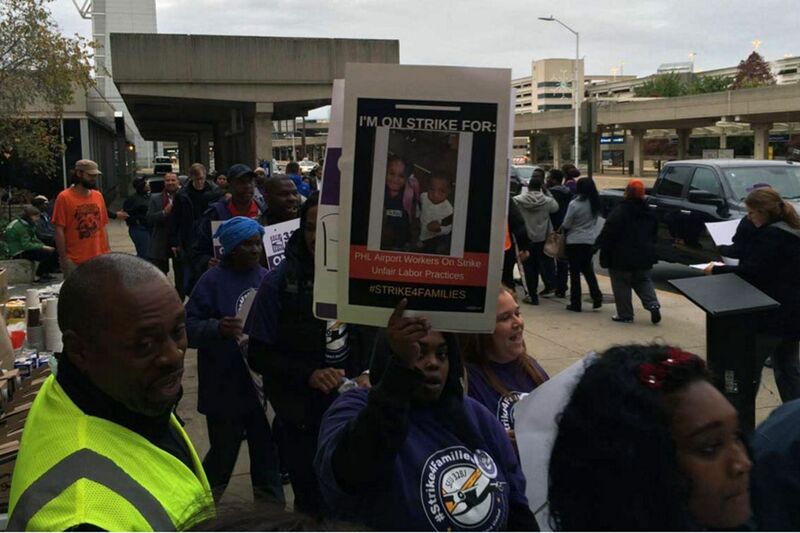 The Philly airport workers who spent the day protesting were not alone. Also walking picket lines were their colleagues in Boston; Chicago; Newark, N.J.; New York City, and Fort Lauderdale. "The workers at the airport joined the national strike because we have major corporations in this country who, regardless of what we legislate, think that they can pay poverty wages in an international city like Philadelphia," Councilwoman Maria Quinones-Sanchez said during Council's weekly meeting.